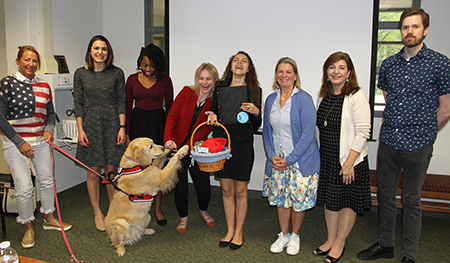 Maggie, the golden retriever, is interested in the basket of goodies created by students to encourage donations for WCC. 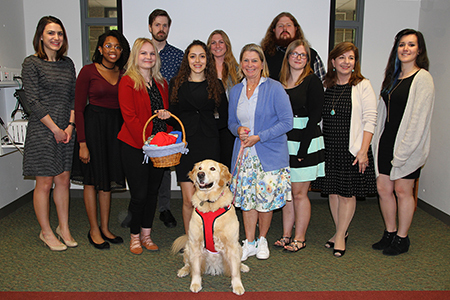 From left are Lisa O'Hara, Maggie's owner and one of the judges, students Megan Jean, Denia Morris, Olivia Stevens and Cierra Ruiz, WCC representative Lex Kochmann, MCCC Professor Tina LaPlaca and student Andre McEwan. The human-canine connection was a theme that ran throughout students' campaigns. Two teams were selected as the officials winners: front row, from left, Megan Jean, Denia Morris, Olivia Stevens, Cierra Ruiz, WCC rep Lex Kochmann, Madison Hunt, Professor Tina LaPlaca, and Katie Rojas; back row, from left: Andre McEwan, Cailin Shymko and Kevin Ronan. Team 2 describes its vision for fundraising on the WCC website, with levels of giving progressing from bronze to silver to gold to platinum. 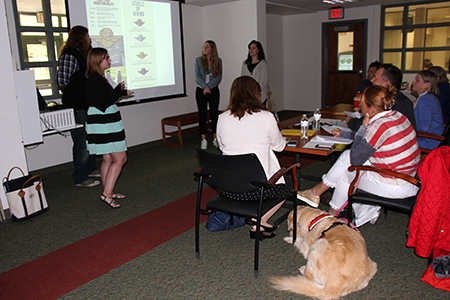 West Windsor, N.J. – It was puppy love – and a lot of creativity and talent – that drove Mercer County Community College’s (MCCC) advanced Ad Design students this semester. 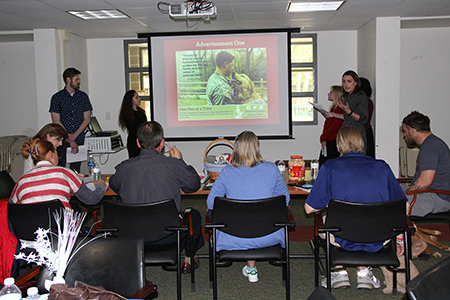 As the capstone project in their Ad Design III course, four teams of students took on a semester-long assignment for Warrior Canine Connection (WCC), a nonprofit organization that trains dogs as service animals for military veterans. 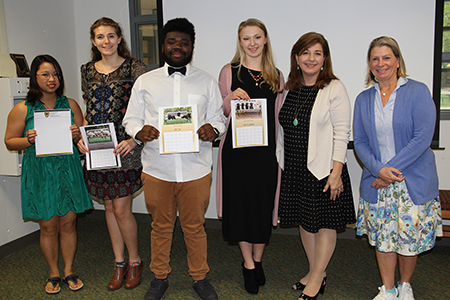 On May 4, the students presented comprehensive marketing campaigns to a five-judge panel, including several WCC representatives. Campaign elements ranged from logos and color palettes, to ads, posters, brochures, websites, social media sites, stationery, newsletters – even merchandise. Clever slogans and themes abounded, as students made the most of the canine theme. Among the memorable slogans were “Give a Dog a Bone,” “One Paw at a Time,” and “Meet our New Cadets.” Adorable puppies were featured alongside graphics and copy. Merchandise for purchase included specially-designed t-shirts and caps, as well as dog toys, chewy bones and other goodies for dogs. Each website prominently featured a “Donate Now” space. Another judge, MCCC Veteran Services Director John Becker, observed that the Warrior Canine Connection organization received the benefit of some truly exceptional advertising campaigns that would undoubtedly be the envy of any Fortune 500 Corporate Advertising Department. While two of the teams were declared the official winners, Kochmann was certain that elements from all four campaigns would find their way into the group’s marketing efforts. “The final products were that good,” she said. Other judges included Rob Smythe, of Adoor A Pet, Lisa O’Hara, who brought her golden retriever, Maggie, to the event, and Gabriel Matt, a veteran and MCCC alumnus who graduated in 2016 and travels with his service dog, Louie. 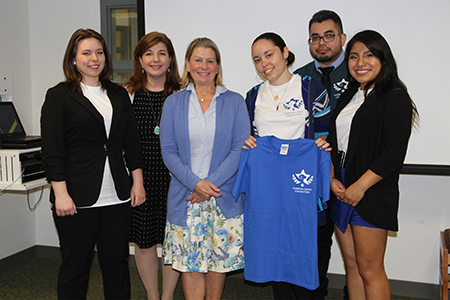 According to Professor Tina LaPlaca, coordinator of the Advertising/Graphic Design program, the students wanted to create a campaign for a nonprofit group that worked with veterans and WCC was a perfect fit. “Looking at the quality and quantity of the work, it’s clear to me that these students put a tremendous amount of creativity and effort into their campaigns. This goes way beyond a classroom assignment and becomes something the students invest in,” she said.